You bought your iPhone to do many things but when an important one is just reading e-books, there is a solid alternative. Appleinsider on whether a Kindle is worth your time and money. If you're seriously trying to decide between either the iPhone XS Max or the Kindle and price is no object, then put Amazon's device down right now and just buy the phone. It's the same if you're looking at an iPhone XS or an iPhone XR. What these devices can do for you dwarfs anything the Kindle is capable of. Except for one specific thing —there is one killer feature that makes Kindle a contender. It's not the battery life, though that will typically see you through a couple of weeks instead of a single day. It's not even the price, though that can easily be a tenth of the cost of an iPhone XS Max. The killer feature for Kindle is how you can read books on it anywhere, even in the brightest of sunlight. So on the one hand, you have the iPhone which is practically a supercomputer in your pocket, and on the other you have the Kindle. Lightweight, readable in all weather conditions, and cheaper. We're not going to pretend that the Kindle beats the iPhone all-around but we are going to claim that it's a solid choice for reading e-books. And in the right circumstances, there are reasons to buy one as well as your iPhone. This is really about comparing the hardware. It's about the physical Kindles and iPhones plus the software on them for reading e-books. Kindles come with their own e-reader software. For iOS devices you can get the Kindle app and the Apple Books one, both for free. To make the comparison fair, we're looking only at Kindle titles on both machines. However, the two stores by themselves summarizes the different approaches the two companies take to books in general. Amazon Kindle has a far greater range of titles but Apple Books look better. That's it. 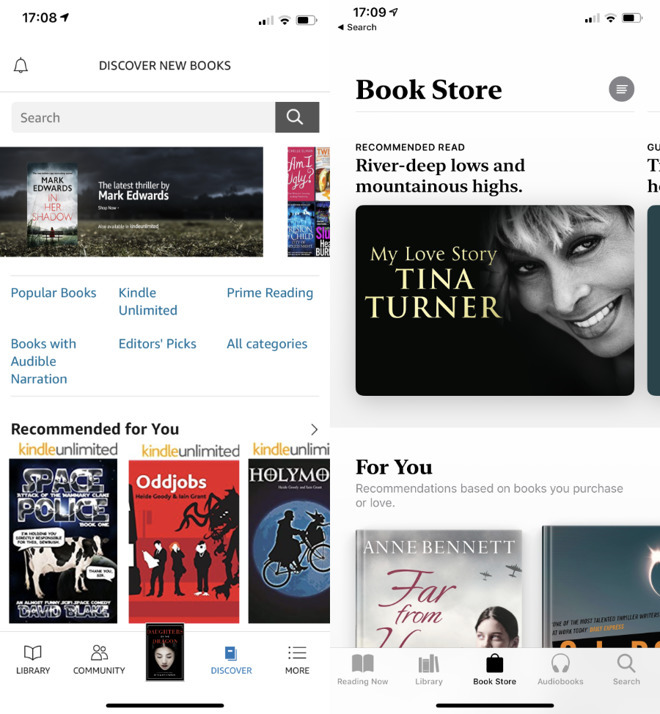 We tend to prefer the look of Apple's Books enough that we check out Apple's store before we go to Amazon's —but the range of Kindle books is unmatched. That said, if you buy a hardware Kindle device then you are stuck to only buying Kindle books. Whereas if you buy an iPhone, you get both: iOS devices can show you Kindle books as well as Apple Books. There is an issue over how you actually buy books, though. 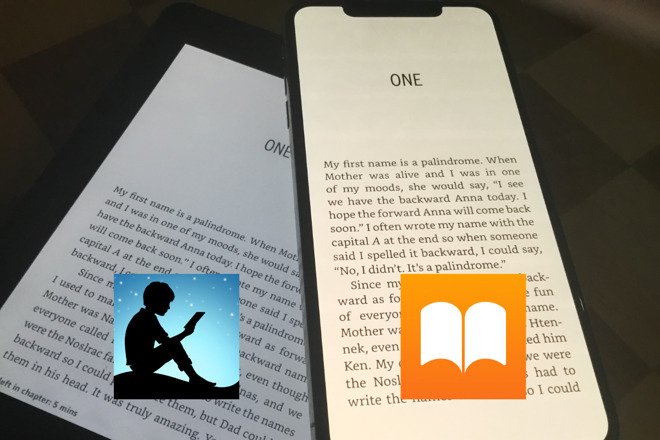 While you can get both Kindle and Apple Books on iPhone, the process is different. Buying Apple Books couldn't be easier but buying Kindle books on iPhone most definitely could. It's a chore to buy a Kindle book to read on iPhone. This is specifically because Amazon won't pay Apple a cut from its book sales and so Apple won't allow you to buy books directly from the Kindle app. It's a corporate disagreement that results in our having a less convenient time. You have to go to Amazon on a browser, perhaps even Safari on your iPhone, and buy the book there. Then it gets delivered to your Kindle reader, whether that's an app on your iPhone or an actual Kindle device. Still, you do get used to it and buying e-books does become the work of moments. Truly, the killer feature is that screen's lack of reflectivity in sunlight. It's an e-ink display instead of an OLED or Liquid Retina one which means it is lower resolution and it's also in monochrome. So far that doesn't sound like a win for the Amazon device. And in practice it's easy to overstate the usefulness of the anti-reflective screen. We have only rarely had situations where we couldn't read our iPhone screens and we didn't get it once on a recent trip around sunny Los Angeles with an XS Max. It's just that when you do get the problem, when you do struggle to read the screen, it's total. You might be able to shield the screen with your hand for a moment or contort to read it from upside down, but really you need to find some shade. Whereas the Kindle is comfortably readable anywhere and for as long as you need. That can be a considerable time, too, as the battery is rated at lasting for 30 days on half an hour's reading a day. It's also got adaptive lighting which means whatever time of day you want to read, models like the Kindle Voyage and Kindle Oasis won't ever be too dim or too blinding. Today's iPhones can match or exceed that adaptive lighting, though, and they do so through technology that also helps with reflectivity. The iPhone 8 and newer have what Apple calls a True Tone display and iOS features Night Shift. True Tone uses the iPhone's sensors to monitor the brightness of ambient light and adjust the screen to suit. Night Shift alters the colors in your display, moving them subtly toward the warmer end of the spectrum. So between these two, what happens is that late at night in a darkened room, the iPhone's display will be turned down so that there's little glare. Equally, in bright sunlight, True Tone adjusts the display to remain readable for longer. When True Tone was first announced with the iPad Pro 9.7 inch model, Apple claimed that this made the display 40 percent less reflective than the iPad Air. It's still not as universally readable as Kindle but, again, the iPhone XS Max has bene fine for us in regular use. And then there is the issue of what you actually see when you can actually see it. 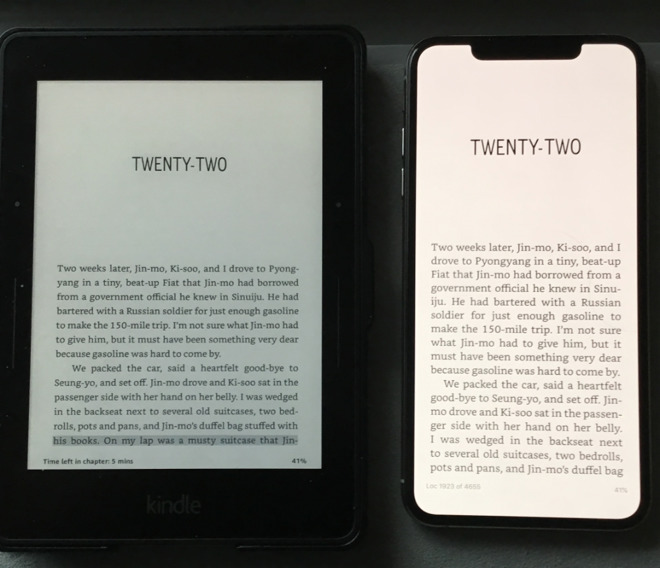 This is not going to be as useful as you might hope: here are side by side screen grabs from a Kindle Voyage (left) and the Kindle app on an iPhone XS Max (right). On these default font settings, the Kindle Voyage displays about a line more text than the Kindle app on iPhone XS Max does. The iPhone one isn't just higher resolution, though, it also has finer font displays and to our eyes, the difference here is striking. 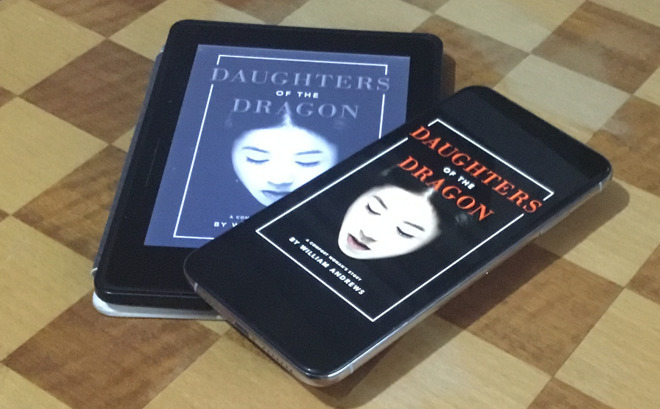 Where the Kindle Voyage is fine, the iPhone XS Max is a pleasure to read. It's also in color which makes no difference at all to the reading experience but it does to how it feels as you move around the app. 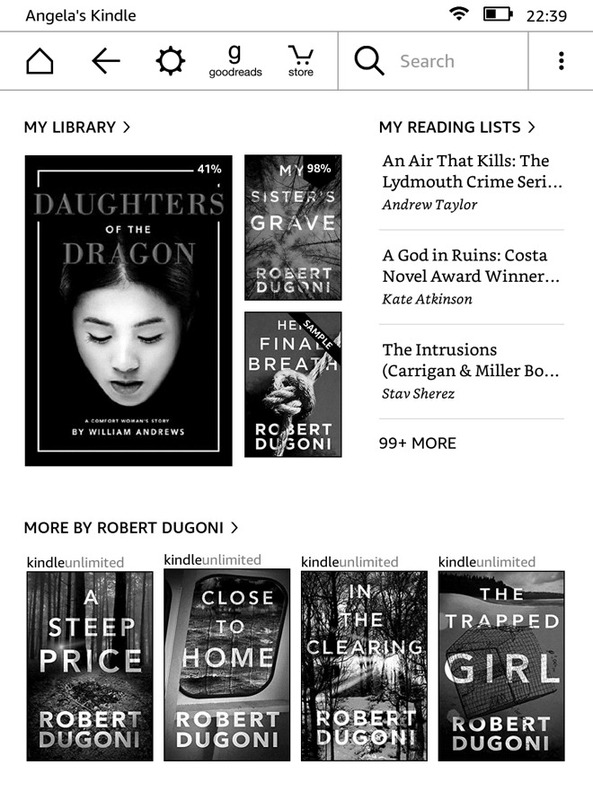 When you've finished a book and want to pick something else from your Library, hardware like the Kindle Voyage is in monochrome and shows you quite little. Remember that this is your own library where you're meant to pick from the books you've bought. In this example, you're shown three books you've read, three you've marked as wanting to read, and four that are adverts. By comparison, the Kindle app on iPhone is in color, it has that much greater resolution, and it uses all of this to show you more and finer detail. With this example you're seeing nine books that are in the library plus recognizable tops of three more. In daily use, the iPhone's Kindle app is clunky enough that you regular have to stop to think what you want it to do. And sometimes the answer is that you need to force quit the app and try again. Yet the iPhone experience is visibly so much better than the Kindle. You don't need an excuse to buy the iPhone, you can just go do that. If you're hesitant over getting a Kindle as well, we can help you there. That's because for all that we did weigh up the differences and we did read on both, in practical, extended use, the Kindle Voyage does much better than we'd expected. The iPhone is literally heavier but it also feels figuratively heavier: there's something in that makes you sense a lot has been compressed into its casing. Whereas the Kindle is light to the point of making you careless with it. When you know you'll want to read, just chuck it in your bag or a coat pocket. You'll never be conscious of its weight. Then, think about the Kindle's battery life. It's far better than the iPhone's, but all the time you're using your Kindle, you're not using your phone. So if you get both, you're actually helping your iPhone's battery life. And if that sounds like a post-rationalization of people trying to justify purchases, well, you've got us there. Yet there really is something to having a traveling bag that has both an iPhone and a Kindle.